China Foreign Teacher News, Updates, & Scam Alerts: Scam Warning! 30% of all Z visas now held by foreign TEFL Teachers in China are illegal and 40% of TEFL certificates are fake - both can get you arrested and deported. Scam Warning! 30% of all Z visas now held by foreign TEFL Teachers in China are illegal and 40% of TEFL certificates are fake - both can get you arrested and deported. The Z visa in your passport may be illegal. Until you get arrested you may never know. By Michelle P.
Only after one of our dear colleagues was recently arrested for "an illegal Z visa" did we realize that they are so common throughout China and that a huge black market exists to buy and sell them with an estimated worth of $3 million a year. They are issued by your ACTUAL EMPLOYER and not by a third party company that may be friends of, or cooperating with your company. Real visas are also linked to an invitation letter that is issued by your actual employer "ABC English " (for example) not XYZ Culture Company (for example). FAKE OR ILLEGAL Z VISAS: Are either sent to you by courier abroad in your homeland, or given to you by a private person in China with instructions how and where to stick them in your passport, or here is the tricky part..."are generated by a party other than your actual employer", which is usually not a education facility but just some company that will sell this "favor" to your employer for a fee that may range from 10,000 yuan to 20,000 yuan. Then of course, there are just plain counterfeits that some clever Chinese scam artists create with Photoshop which may or may not be coded properly. BY LOOKING AT THESE VISAS, YOU WOULD NOT BE ABLE ABLE TO TELL THE DIFFERENCE! But the PSB has a portable scanning device that is linked to their huge database by G4 and within a minute or two, they know if you are holding a legal Z visa or not. 1. Was your invitation letter issued by your actual employer (the same Chinese &amp; English name that appears on your contract and matches the red seal chop) and mention working dates that span more than 3 months? 2. Was your visa pasted into your passport at a Chinese government PSB office, embassy, or consulate? 3. Did you pay less that $200 for your visa? If you answered yes to all of the above you have nothing to worry about. You are legally working in China assuming you also have a real university degree and are 22 years of age or older. If you answered "no" to any of the above questions, you have a big problem that needs to be fixed ASAP, or like our colleague, you can be randomly asked at a subway station to show your passport to a uniformed or plain-clothes PSB agent, and within 45 days you will be back in your homeland following 30 days in a Chinese jail and a $2,000 fine. For more details about this scam and others that target inbound ESL TEFL teachers to China refer to (click here>>>http://reddit.com/r/chinascamcentral, or our monthly blog here at... click here >>> http://chinascampatrol.wordpress.com without delay. 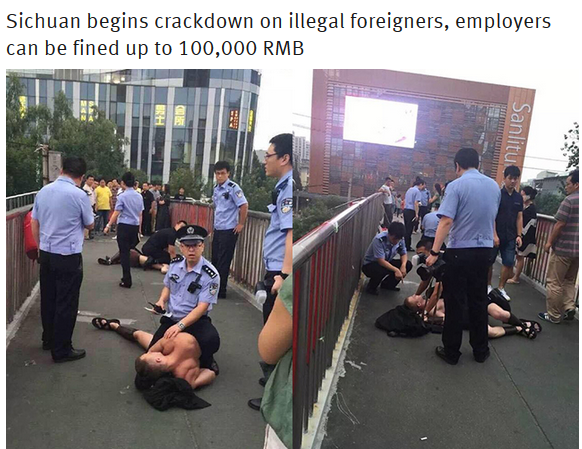 What to do if you are arrested in China? Stay Safe And Get Legal!